We are a nation at war and it still surprises me at times but most things about war surprise me and shock me. I am always amazed at the casualty numbers and how we separate our American losses from the countries we are fighting. The number of civilian losses in Iraq are staggering yet we scarcely blink an eye because it is not "our" people. Well there in lies much of the problem. I believe in the interdependence of all things. In early science classes we were all taught about ecosystems and that organisms working in harmony as a community result in growth and life. We seem to forget it applies not just to plants and other animals. We are part of it too and it includes the people we count as separate from us based on imaginary boundary lines. 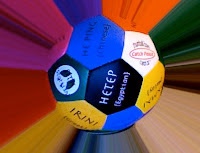 We came to create a ball of hope, The Catch Peace Thumball is covered with the word Peace in different languages just like our world is covered with different nations and tongues. We use it to discuss the many languages that exist and find on a map where they are spoken. It is fun to highlight the different way words sound and trying to pronounce words "foreign" to us. We use Catch Peace Thumball to honor the belief that to focus on our similarities not only our differences will help cultures understand each other and lead to communication and respect. It is a small step perhaps but to share the concept of oneness to children from a young age can't be a bad thing. The war being fought is not American vs. Iraqi. The majority of Iraqis are people like us raising families, working hard, living simply and wanting peace. Toss it around, practice saying peace. it just may give peace a chance... of growing.